Thanks for choosing to spend your hard earned money to purchase this product. My goal is to help make teaching easier for you. All of my products are products I use in my own fifth-grade classroom, so I hope that you will find them useful as well. 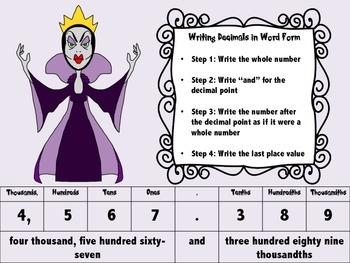 This set includes four anchor charts for teaching skills with decimals (including writing them in word form, writing them in expanded form, rounding decimals, and comparing decimals). In addition to the larger anchor charts that can guide your instruction of these skills, you also receive a page of miniature anchor charts to copy and give to students for their math notebooks. The task cards included in this set can be used in a variety of ways. The first two sets can be used as a matching game OR you can use the task recording sheet to have students move around the room to record their answers (for instance, if the card presents expanded form, they would write the standard form of the number as their answer). 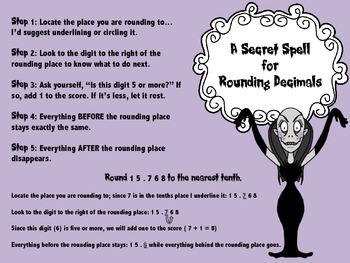 The third and fourth sets of task cards should be used with the recording sheet to write the rounded answer or >, <, or = depending on what would fit best in the witch’s crystal ball. 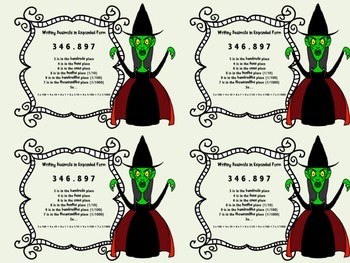 The body shop activity is differentiated with 4 beginner, 4 intermediate, and 4 advanced level task cards that requires students to add (and possibly multiply, decimal numbers depending on ability). The final set of cards includes 28 decimal cards that you can pass out to each student and have them perform a variety of operations including adding, subtracting, multiplying or dividing. Students could also compare answers OR use the rounding recording sheet to round the numbers to the places designated in each column. I use a strategy called mix-freeze-pair. Each student is given a card; the teacher calls mix (and the students move around the room); the teacher calls freeze (students freeze exactly where they are); the teacher calls pair (students pair with someone they are frozen near); students then share cards and perform the task. Please feel free to contact me should you have any questions about how to use these, or feel free to also make them useful however you see fit.